Featuring Full-Wrap 4-Color Process Laminated Labels!!! commercials or seeing the print ads, planting the seed that hot sauce is hot. Set up charge for 4 color process $95.00 (v). The Set-Up Fee includes charges for the initial proof and up to two revisions of the initial proof. A fee of $25.00 will be charged for each additional revision. 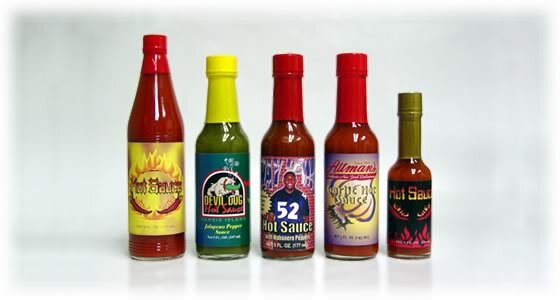 5 OZ Hot Sauce flavors available in Jalapeno, Habanero, Garlic. 2 OZ Hot Sauce available in Tabasco pepper. Exact PMS matches: Please call. Great Freight rates available all over USA. 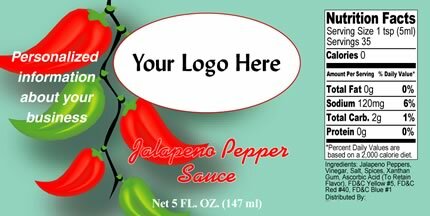 Please call for larger quantities or other sizes, flavors or sauces. No per color or full bleed charges. Drop Shipping available. Three or more drop ship locations add $15.00 (v) each. All orders must be in even case quantities. RUSH ORDERS: Rush 20%. Rush service is available, please call. Standard production time; Shipping is scheduled 10 business days after label proof approval. CHANGES/CANCELLATIONS: Cancellation and/or change charges may apply after artwork is processed, please call. 1. One time Set-up charge 4 color process $95.00 (v). We work with Adobe CS2 or QuarkXpress 6.5. ALL FONTS USED MUST BE INCLUDED or must be converted to outlines. Camera Ready Art - Line Art black image on white background. Please submit the largest clean sample for reproduction. Colors - Please note that Disk colors and PMS colors may differ slightly on some label mediums. Email all art files to art@4privatelabel.com. 3. Custom Logo development available at $75.00 per hour (v).